If you’re a small plane looking to make an emergency landing, there’s really no better place than the LA River. Mostly because large stretches of it aren’t so much a river, as it is a long concrete wasteland. Ever seen the movies Drive or T2? Then you know what I’m talking about. 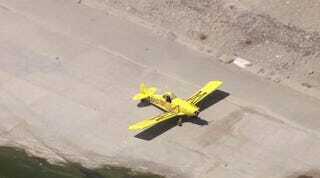 According to CBS Los Angeles the small aircraft had to land around 11:15am local time this morning. The pilot put the plane down in the part of the river that runs through Vernon, just outside downtown LA. Vernon is said to be the inspiration for the fictional town of Vinci in the second season of True Detective, which I’m told is a television program about grumpy people who make an assortment of grumpy faces under lights that are just a bit too harsh for their features. There were no injuries reported during today’s emergency landing. Viewers of the second season of True Detective, on the other hand, could not be reached for comment on their injuries.